The 2017 Super Mod Cup Contest continues with six awesome Mega Mods including a storage bumper mod, rainwater collection and filtration mod, battery system mods, camper jack mods, and more. Welcome to the December 2016 Super Mod Cup Contest. Please review the following six Mega Mods and vote for your favorite mod. We will announce the December 2016 Super Mod Cup Contest winner next week. For more information about the monthly mod contest, including how to enter, click here. As we all know truck campers usually lack a few things because of the limited space available. 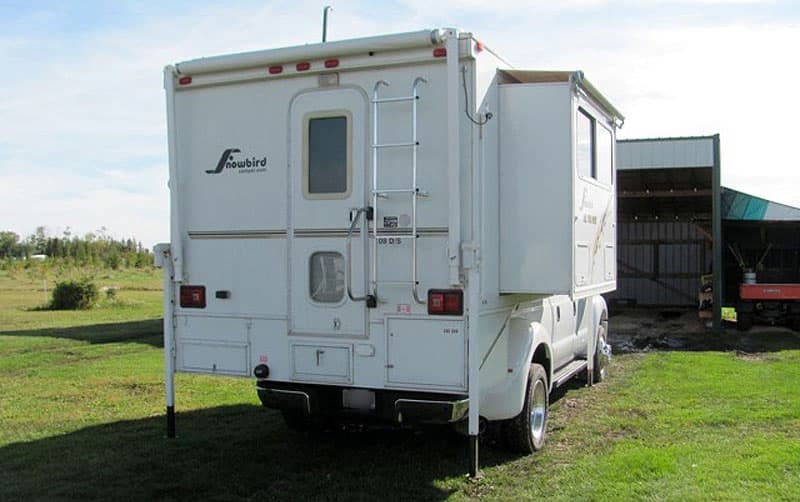 I wanted to address three main things: (1) more stuff storage, (2) more grey tank storage, and (3) a better, safer, and more user friendly way to enter and exit the camper. 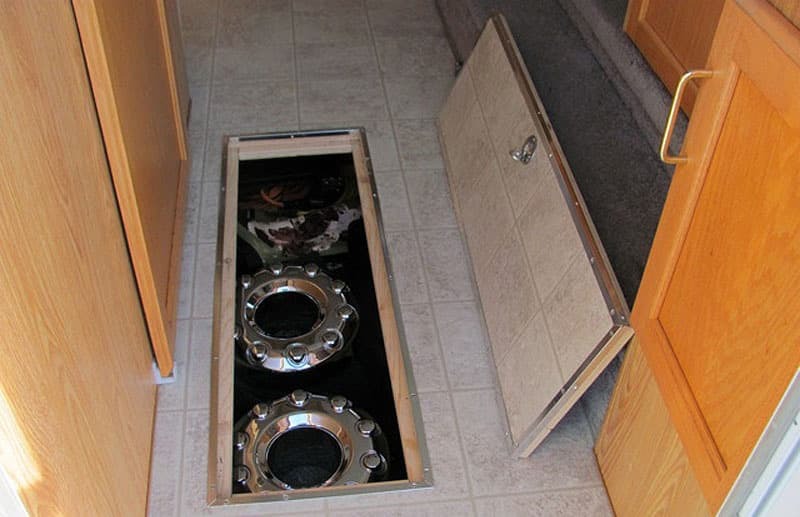 This camper had a tunnel in the basement area where an aluminum stair system was stored. This tunnel and stair system was accessed from under the door. Every time you needed to get in the camper, out it came. This stair system was much too narrow, especially when we are being pulled by Madi, our Pointer. We are explorers and do not usually spend more than a night in one location. Also, we have many stops on our travels. The stair situation was a real pain. Grey storage is an issue for most of us. Having a dry bathroom with a walk-in shower was one of the features we were looking for. However, the height of the drain in the shower meant that the shower water went into the black tank at the rear of the camper in the basement. The black tank in our camper is small, which is fine for toilet use, but two short showers and you may get something you don’t want between your toes as the tank over fills. Adding some piping in the rear step mod for grey water storage (shower) was a must. Stuff storage can be an issue, especially on a long haul. Some things don’t take up much space, but you don’t want them inside (fluids for the truck, sewer hose extension and fittings). These can be stored in the exterior compartments. The now unused tunnel where the old stair system was stored can now be a large secure storage area for seldom used items. I cut a hatch through the floor inside the camper to access this area. A large rear step storage unit was constructed to deal with our wants. A three step set of RV stairs was installed that folds down with minimal effort and provides 24-inches of wide, non-slip footing.